The heat dome will cover almost 90% of the country during the time period of June 29th through July 6th which means many states will have temperatures in the 90s and in some cases low 100s. The exception will be the Pacific Northwest where a cold front will push through keeping temperatures in the 60s and 70s, lucky them! 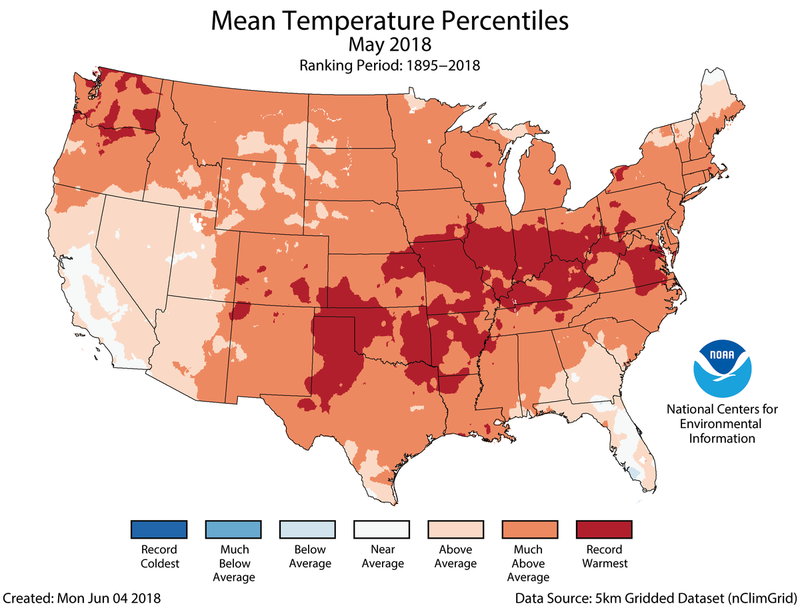 In May, the country experienced extreme temperatures with heat covering almost the entire country. Daily high records fell with 8,590 station records for the month of May. Minneapolis was 100 degrees F May 28th making the earliest 100 degrees F day. It will be interesting to see the assessment of high temperatures after June and July are over. This will be an extreme heatwave for the country especially in areas of the Northeast and Mid-Atlantic. The big cities of the I-95 corridor for example will see highs in the 90s to near 100, but in the city themselves it’s going to feel awful due to the high dew points creating high heat index values. The main issue with the extreme temperatures will be the dew points that combined with the high temperatures result in dangerous heat index. Many states from the Plains to the Northeast will have heat index values well into the 100s which can be dangerous for people outside. The long range temperatures for the the month of July show the above normal temperatures will continue across the East and will also move into the western part of the country. Relief may only come from daily thunderstorms or from the tropics as the tropical season will get started by mid to late month. Below are a couple of maps showing some interesting features. Ryan Maue posted on twitter a map of the heat dome using the ECMWF 500 mb height contours. Another map below shows the 500 mb heights across the country for next Tuesday. I’m glad I live where I do in Maine since it would appear to be the state least affected by the heat (long-term) east of the Rockies.